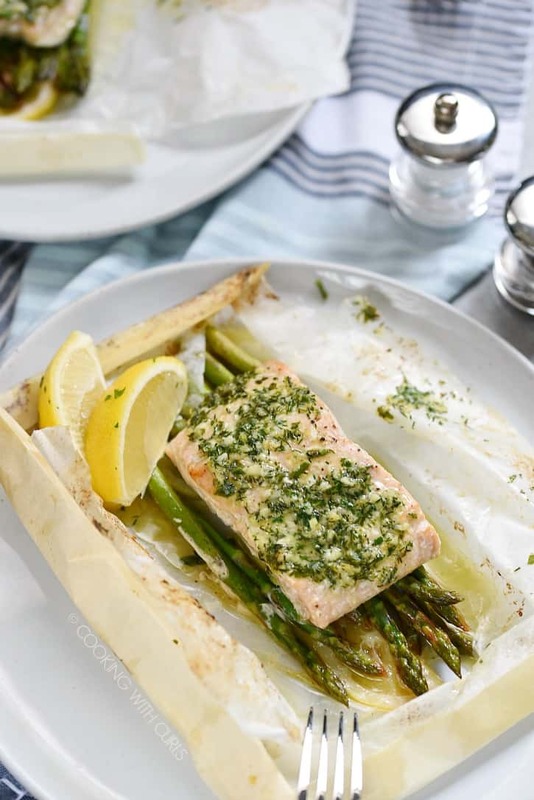 Baked Salmon in Parchment with Asparagus Lemon and Dill is an impressive meal that is simple to prepare, and the entire family will love! It is loaded with flavor from the compound butter, and baked to perfection in it’s own little pouch. 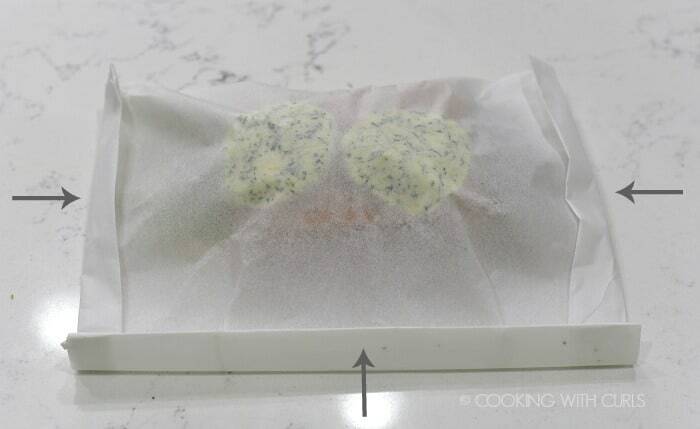 The parchment paper traps the moisture and steams the salmon to moist and tender perfection!! 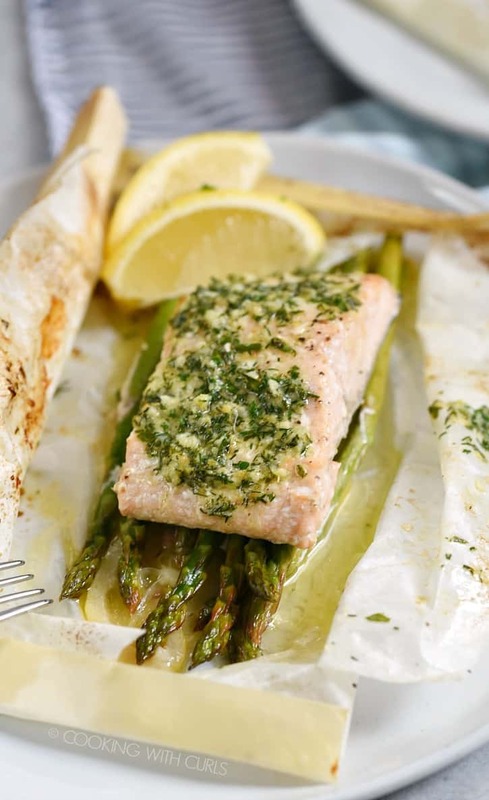 Baked Salmon in Parchment with Asparagus Lemon and Dill, also known as Salmon en Papillote is easy to prepare and creates a dramatic presentation when served. Fold 4 sheets of parchment paper in half. 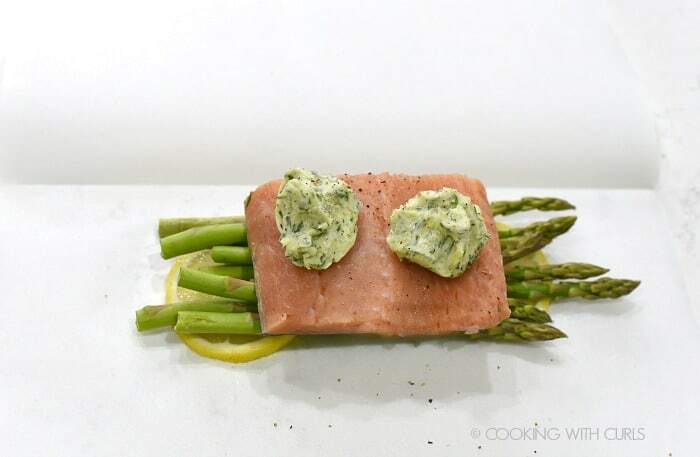 Place 2 to 3 lemon slices towards the center of each paper…..
Place 9 asparagus spears on top of the lemon slices…..
Place a salmon filet on top of the asparagus and sprinkle with sea salt and black pepper…..
Place 2 Tablespoons of the compound butter in the center of each filet….. Fold the parchment paper over the salmon. Starting with one of the small ends, fold the paper over in 1/2-inch increments until you reach the salmon. 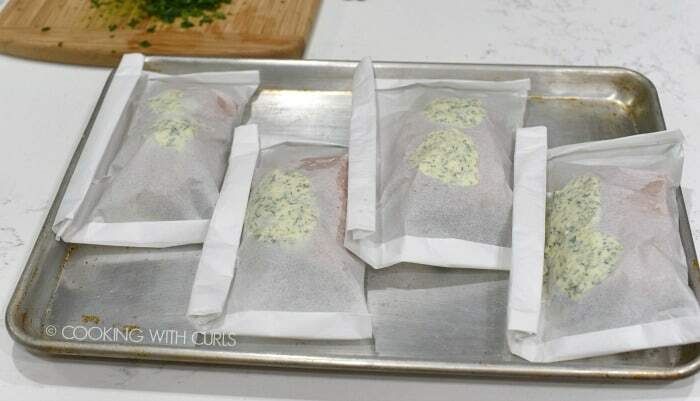 Fold the second small side the same way, then fold over the large side to create a pouch…..
Place the salmon packets on a baking sheet…..
Place in the oven and bake for 10 to 15 minutes. The pouches will puff up from the steam and start to brown around the edges…. Allow the pouches to cool for five minutes before cutting them open….. The steam is VERY hot so be careful when opening! 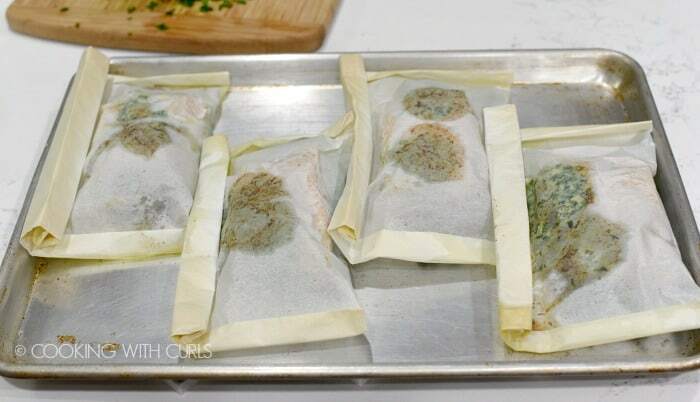 This is the way that i have always created my parchment paper pouches. You can also cut the parchment paper into an oval or heart shape and roll the edges over to create a half-moon shape that looks like a calzone. If your salmon is on the thin side, cut the cooking time down a couple of minutes. Each oven is different so cooking times may vary. Once they puff up, they are done. If you do not like dill, thyme or tarragon are delicious as well. If fresh herbs are not available, use dried but cut the amount down to 1/2 a teaspoon each. You can also make the compound butter ahead of time, wrap it in plastic wrap and freeze until hardened. 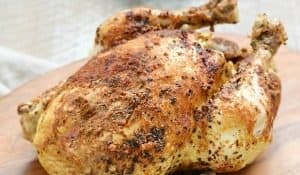 I was creating a typical weeknight, throw everything together kind of meal and chose not to chill the butter. 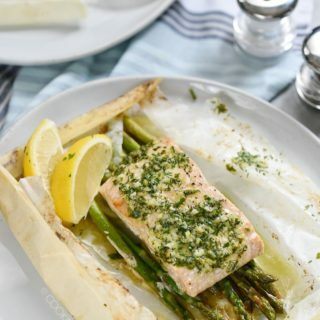 Baked Salmon in Parchment with Asparagus Lemon and Dill is an impressive meal that is simple to prepare! 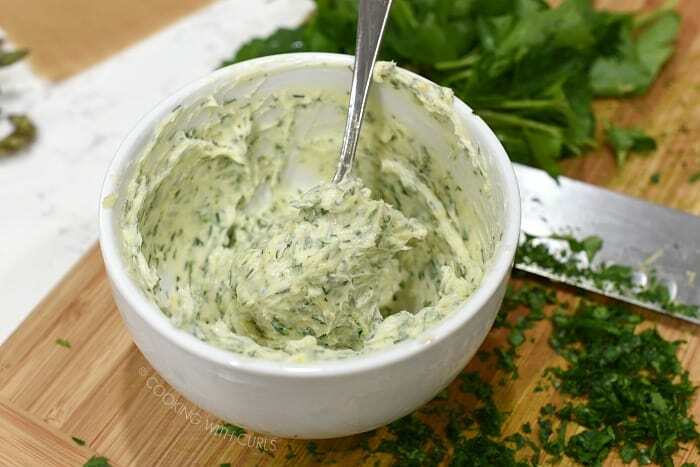 In a small bowl, stir together the butter*, dill, parsley and lemon zest. Set aside. Fold 4 sheets of parchment paper in half. 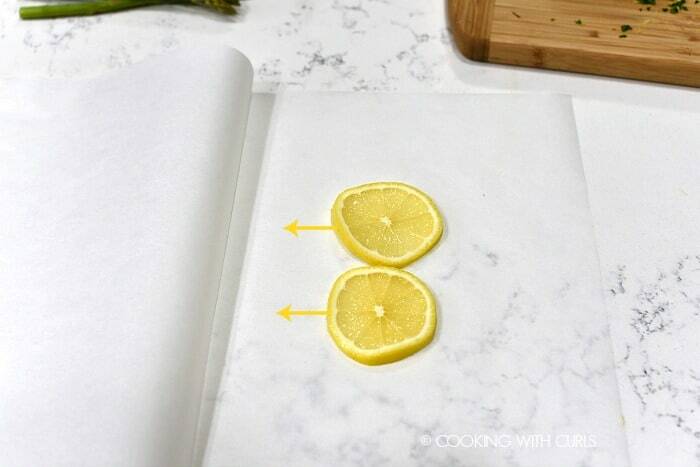 Place 2 to 3 lemon slices towards the center of each paper. 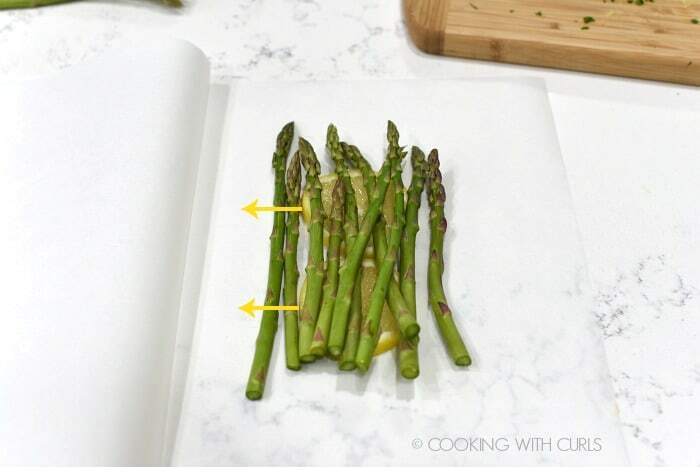 Place 9 asparagus spears on top of the lemon slices. Place a salmon filet on top of the asparagus and sprinkle with sea salt and black pepper. Place 2 Tablespoons of the compound butter in the center of each filet. Fold the parchment paper over the salmon. Starting with one of the small ends, fold the paper over in 1/2-inch increments until you reach the salmon. Fold the second small side the same way, then fold over the large side to create a pouch. 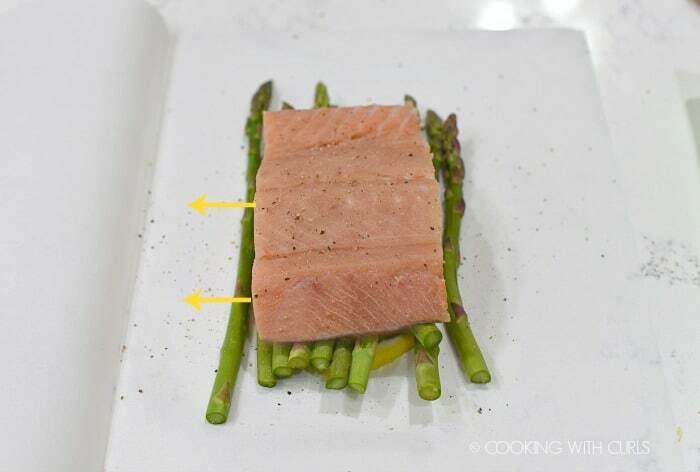 Place the salmon packets on a baking sheet. 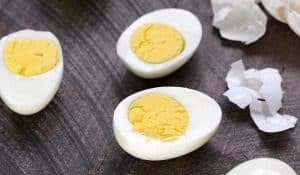 Place in the oven and bake for 10 to 15 minutes. The pouches will puff up from the steam and start to brown around the edges. 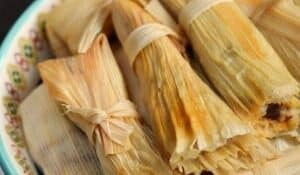 Allow the pouches to cool for five minutes before cutting them open. The steam is VERY hot so be careful when opening! It helps to have the asparagus spears the same length. It makes it easier to fold the parchment paper up closer to the salmon.